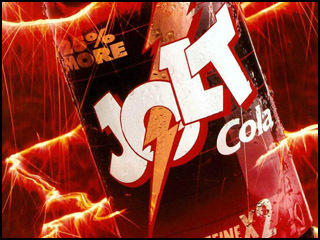 Jolt Cola: "Twice the Caffeine"
As an observant sociology major at SUNY Potsdam, C.J. Rapp noticed that students were constantly concocting beverages designed to help them stay awake to finish term papers, complete research projects, or study for exams. In 1985, the student-turned-beverage-inventor unleashed Jolt Cola, not an energy drink but a high-caffeine, high-sugar brand of cola. At a time when beverage producers were promoting the idea that less is better - that they contained either zero or less caffeine, sugar, or calories - Rapp promoted his cola by emphasizing that it had twice the caffeine found in other colas. It pioneered a marketing strategy still widely in use by energy drink producers today, targeting a generally younger audience, mostly students and young professionals, billing itself as something not necessarily healthy but which will allow them to cram more hours into their day. The relatively recent energy drink phenomenon in North America has grown out of the massive popularity of Red Bull (one of the first energy drinks on the North American scene post-Jolt, from an originally small Thai producer), which still has roughly 47% of the market share. Major players such as Pepsi, Coca-Cola, Molson and Labatt have tried to match the small companies' innovative and different approach with less success. In Japan, the energy drink phenomenon dates at least as far back as the early 1960s, with the release of the Lipovitan D drink from Taisho Pharmaceuticals. Most such products in Japan bear little resemblance to soft drinks, and are sold instead in small brown glass medicine bottles or cans styled to resemble such containers. These "genki drinks" are marketed primarily to the salaryman set, to help them work long hours, or to stay awake on the late commute home.